Astronomers use computer simulations based on theoretical models to explain massive star formation observed in dwarf galaxies. One of the main predictions of the current model of the creation of structures in the Universe, known at the Lambda Cold Dark Matter model (LCDM), is that galaxies are embedded in very extended and massive halos of dark matter which are surrounded by many thousands of smaller sub-halos made also from dark matter. Around large galaxies like the Milky Way these dark matter sub-halos are large enough to host enough gas and dust to form small galaxies on their own, and we can observe some of these galactic companions, known as satellite galaxies. These satellite galaxies can orbit for billions of years around their host before a potential merger. Mergers cause the central galaxy to add large amount of gas and stars, triggering violent episodes of new star formation −known as starbursts− due to the excess gas brought in by the companion. The host’s shape (morphology) can also be disturbed due to the gravitational interaction. Smaller halos form dwarf galaxies, which at the same time will be orbited by even smaller satellite sub-halos of dark matter which are now far too tiny to have gas or stars in them. These dark satellites therefore are invisible to our telescopes, but readily appear in theoretical models run in computer simulations. A direct observation of their interaction with their host galaxies is required to prove their existence. Laura Sales (UC Riverside) collaborated with Tjitske Starkenburg and Amina Helmi (Kapteyn Astronomical Institute) to present a novel analysis of computer simulations, based on theoretical models, that study the interaction of a dwarf galaxy with a dark satellite. The findings were outlined in a just-published paper, “Dark influences II: gas and star formation in minor mergers of dwarf galaxies with dark satellites,” in the journal Astronomy & Astrophysics. They find that during a dark satellite’s closest approach to a dwarf galaxy, through gravity it compresses the gas in the dwarf, triggering significant episodes of starbursts. These star forming episodes may last for several billions of years, depending on the mass, orbit and concentration of the dark satellite. This scenario predicts that many of the dwarf galaxies that we readily observe today should be forming stars at a higher rate than expected —or should be experiencing a starburst— which is exactly what telescope observations have found. Furthermore, similarly to mergers between more massive galaxies, the interaction between the dwarf galaxy and the dark satellite triggers morphological disturbances in the dwarf, which can completely change its structure from mainly disk-shaped to a spherical/elliptical system. This mechanism also offers an explanation to the origin of isolated spheroidal dwarf galaxies, a puzzle that has remained unsolved for several decades. 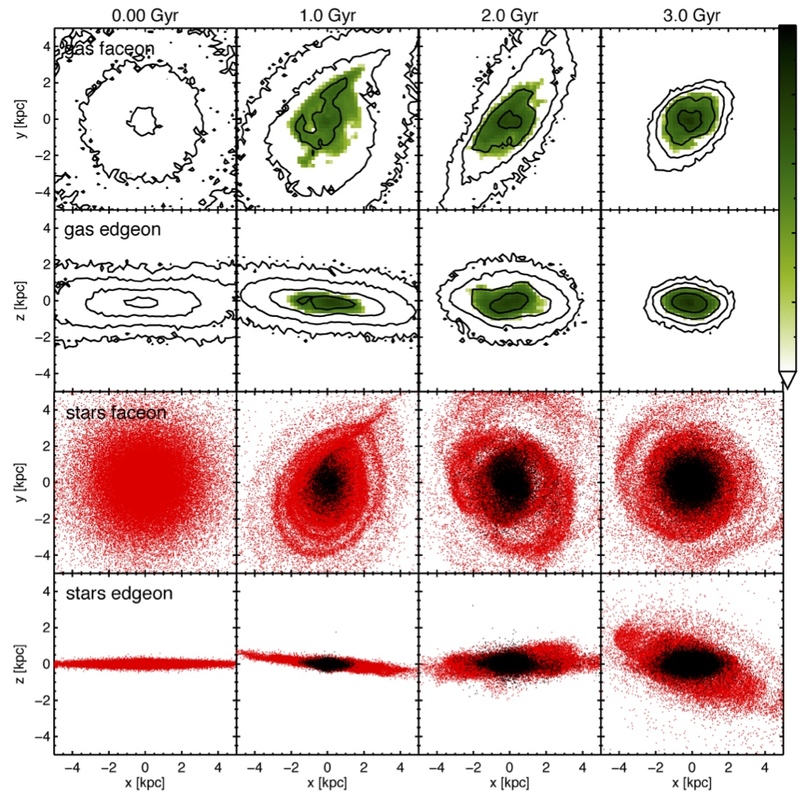 Images: [top right] evolution of a computer simulation of a gravitationally disturbed dwarf galaxy. [Bottom] Density profiles during the simulation of merging systems.